I'm scared of saws, I admit that. 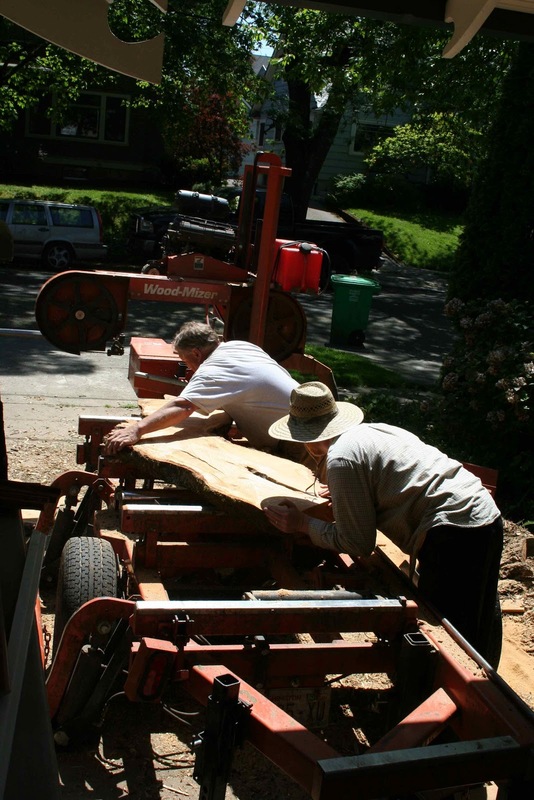 So, I made myself scarce today when we hired Gordon Linn (360-749-1960) to come out and slice up our cherry tree. He does this for a living and he said this was really beautiful wood. Jeff seemed to have fun helping. I hid downstairs and popped upstairs occasionally to take pictures. And now we have a huge pile of cherry lumber. After it dries for about 6 months, we'll have to figure out what to do with it all. We seem to be drowning in wood . . . though there are worse problems. In case others in Portland need this kind of tree service, he charges $60 an hour. You will definitely want to pile it using sticks (look up the correct sizes), and possibly seal the ends to prevent splitting. You might also need to wait a lot longer than 6 months. 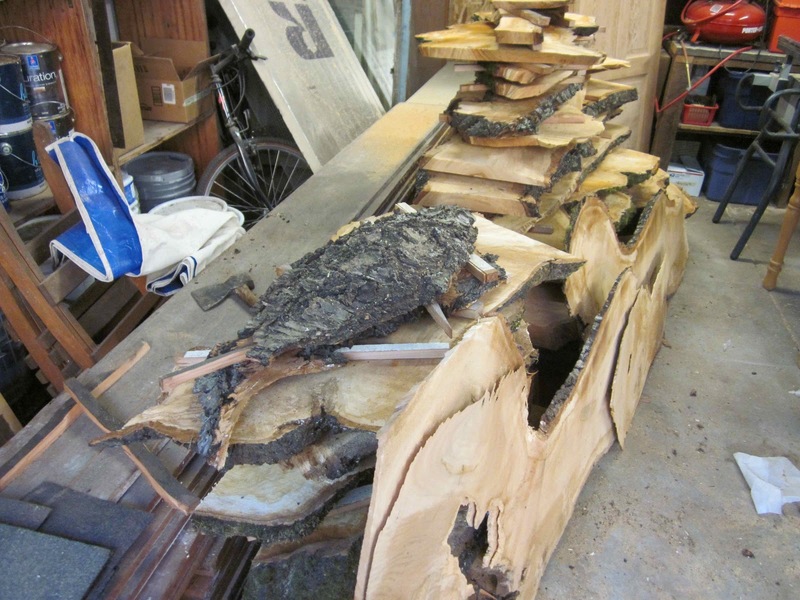 If I recall correctly, well seasoned wood takes closer to 2+ years to thoroughly dry out. The branch was dead on the tree for more than 2 years, it's had quite a while to dry out. We'll try to make sure we use a moisture sensor before we start using the wood. Sorry we missed the action. I am working this week. Yuk. 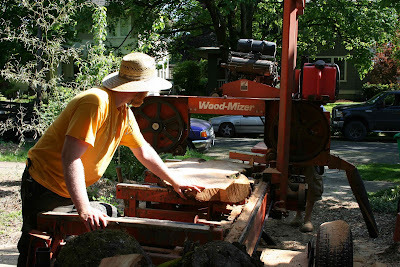 We had a couple of large trees taken down and gave some of the wood to urbanhardwoodrecovery, portland, and supposedly he was going to give us a piece or two after he had cut it into boards and kiln-dried it, but every time we tried to call him he did not answer or return our calls. But if you want someone to haul off wood and make it into boards, kiln-dry, and sell for themselves, just so that the wood is not wasted or turned into sawdust, he will do it. I will be interested to hear how the wood turns out after air-drying. So glad you were able to do this. Godspeed on getting the boards dried properly! 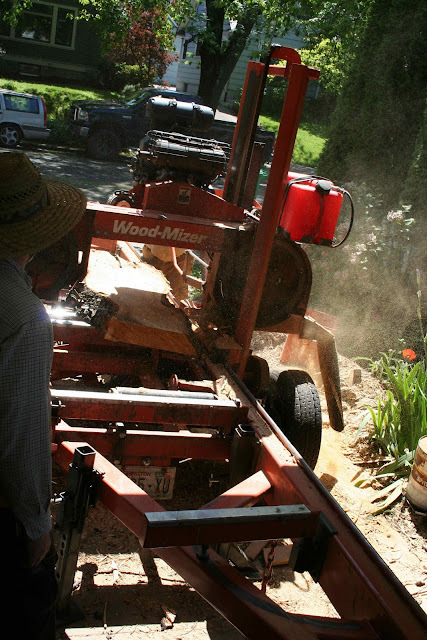 Coincidentally, just this evening I saw an advert in This Old House magazine for this Wood-Mizer machine. Looks like it does a good job.